Part of the project, ‘Every Barn Tells a Story’ is to record the field barns (or Cow’uses) within Muker Parish. Many field barns will be recorded through visits by volunteers who we plan to train during the Spring of 2016. One part of the Heritage Lottery Funding that the Yorkshire Dales National Park Authority (YDNPA) was awarded for this project was allocated to buy software that allows the creation 3D digital models of the barns from photographs. On Friday, YDNPA’s Senior Historic Environment Officer, Miles Johnson, led a workshop on this software at Keld Resource Centre for some of our volunteers who live in the area. The process of creating a 3D digital model is called digital photogrammetry, and involves taking a number of photographs of a building, and then processing them with a program called Agisoft Photoscan, which creates the digital model. The morning started with a presentation on what photogrammetry was, how it worked, and how we could use it, both for EBTAS and for other community heritage projects. This was followed by the volunteers, supervised by some of YDNPA’s staff, visiting a nearby field barn (with the landowners permission) and taking photographs. Finally, everyone put their photographs into the software and had a look at how their models turned out. One out of the three submitted sets of photographs did not process properly and the software did not fully recognise the shape of the barn. Neverthelesss, the other two attempts produced accurate models, that with a little editing will create a good model. Due to time constraints, the models were not processed at high resolution, and are presented here unedited. Some of the images show areas where the software has been unable to differentiate between the barn and the sky – this can with a little time be edited out afterwards. Screenshots of one of the models can be seen here, notice how much detail has been recorded. The models can provide a very accurate record of a building that is suitable for further analysis, and with a little further work we will be sharing them as interactive models online. If you have any questions about the project, please do not hesitate to get in touch using the form below. Cow’us or Cowuss (n). pl Cow’uses. Term used in Swaledale and other parts of the Dales for a field barn or ‘cow-house’. It is essential to understand that while the term ‘barn’ is casually [commonly] used to describe any farm building where hay and perhaps livestock are kept, a specialist (whether the farmer or researcher ) will differentiate between a range of different buildings in farming use. As well as ‘cowuss’, you may encounter ‘hogg houses’ and sheep houses’ (n.b. hoggs are young sheep – not pigs!). 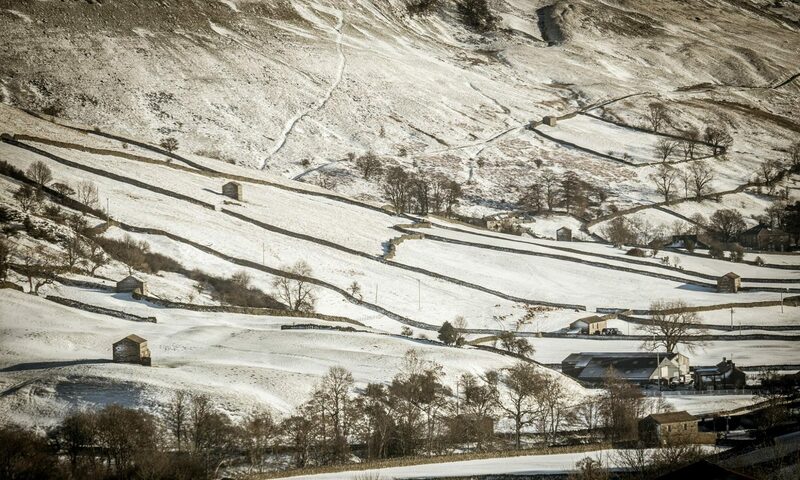 You might find (in Swaledale at least) that using the word ‘barn’ will get you a blank look if you’re talking about a cow’us..
Running parallel to the EBTAS project, money provided through a Legacy is being used to conserve a number of barns in Muker Parish. Four out of a potential eight potential building projects that have been initiated in the last month. Although most of the work on the ground is not likely to start until spring, Gaby and Peter (the National Park Authority’s Building Conservation Officers ) have been developing specifications for the building works – assessing the barns in detail, and figuring out exactly what practical work is needed to restore the barns to top shape for the next few decades. Alongside the assessment of building works, the barns also need to be surveyed for bats, which are protected under law – so a contractor is busy planning and undertaking visits to make sure that the building works do not inadvertently disturb bat roosts.